and MUCH MORE. It’s been over 3 months since the last newsletter. Dates are in blue. Articles are written by Mary Mullen unless noted otherwise. 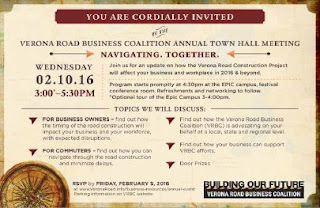 13 - Free Tour of EPIC with Verona Road Business Coalition, Feb. 10. Register NOW! 36 - Medicare Imposters Want to Steal Your Money. Don't let them. A fox has created excitement in our neighborhood. In mid-January Yannette Cole saw it cruising through the south side of back yards on the upper end of Milford Road. It had no fur on its tail. She got a video of it. 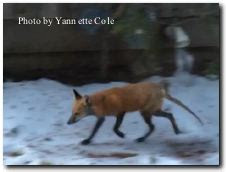 A wildlife expert who previously worked for the DNR suggested that its hairless tail was due to “a probably sarcoptic mange mite infestation.” Yannette reported the fox to the UW Urban Canid Project. 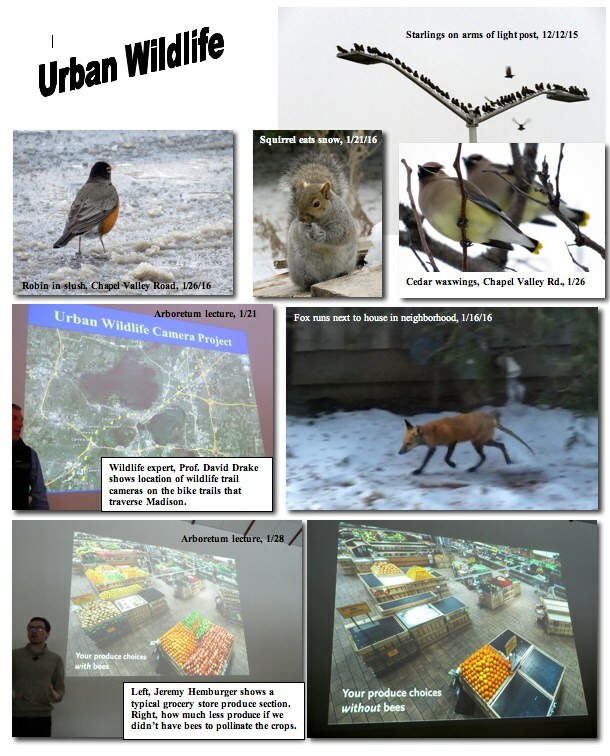 Attendees at the 1/21/16 Arboretum Winter Enrichment Lecture learned about the Urban Canid Project from Professor David Drake of the UW Department of Forest and Wildlife Ecology. Through that project, trail cameras look for wildlife like foxes and coyotes along some of the long distance bike trails in Madison. This includes 3 or 4 cameras south of the Beltline along the the Southwest Commuter Trail/Badger State Trail. The attachment shows a map of the camera locations. Cameras point down to the path area so as to catch wildlife, not people. About 2 weeks later, this same fox was caught on a trail cam in the neighborhood. Still another neighbor, Sue Morovits, saw a healthy fox with a full bushy tail two weeks earlier than the first spotting of the fox with the hairless tail. This fox was in the vicinity of Windflower Way where it meets Danbury Street. You may be wondering what can be done about ill or injured wild animals. One can contact the Dane County Humane Society’s Four Lakes Wildlife Center for trapping and treatment of sick animals. For those who didn’t see the fox but may be interested in what fox tracks look like, here’s a hint. Compared to dogs, their trails are very direct. Rather than run here and there sniffing everything, they often make a beeline in one direction. Their tracks look like a straight line with the tracks spaced more or less evenly apart. You may have heard about the sad case of a coyote hunter killing two dogs that were being walked by their owner, a veterinarian, in the Badfish Creek Wildlife Area here in Dane County on Sunday, January 31. Even though the dogs were wearing reflective vests, the hunter apparently did not recognize that they were dogs, not coyotes. A little research into Wisconsin hunting laws reveals that coyotes can be hunted in any season and that the primary purpose of state wildlife areas is to provide “areas in which any citizen may hunt, trap or fish.” But other uses such as walking, nature study, berry picking, and other low-impact recreational activities are also allowed. Presumably, dog-walking is one of those uses. While many would not condone hunting coyotes, neither is it safe to befriend coyotes that come into residential neighborhoods. They can attack pets. Last summer, there were several reports of attacks on small dogs or chickens on the east side of Madison. Briefly, yell at the coyote firmly, shake a pop can full of rocks, throw sticks toward the coyote, or spray it with a hose. If you have a small pet in the yard with you or a small child, keep that pet in your arms or your child by the hand. If you see a sick or injured coyote, don’t try to scare it away, but instead call Public Health Madison & Dane County Animal Services Dispatch: 608-255-2345. For a coyote that does not respond to being threatened, call 608-267-1987. Even out on Verona Road, you can’t get away from the exuberance of nature. Last December 12, while people were filling up their cars with gas on both sides of Verona Road, European startlings created quite the stir. It was a mild, foggy day, about noon. Suddenly, I became aware of hundreds of birds that were perched belly to belly on the tall highway lights lining the road. The birds looked black as night, but I wasn’t certain what they were. Over 50 could fit on the cross arms of each light pole. They sat there, equidistant from each other mostly facing the same way, apparently enjoying their communal life. Then one or two would take off, and soon the whole flock would fly to another high perch. I wondered if they were waiting for the fog to lift or just enjoying their birds-eye-view. I was glad I usually tote my camera. When I put the pictures on my computer, I could tell for certain that they were starlings. Starlings are black in the summer, but they get a polka-dotted feather coat for the winter. You need to be quite close or be using binoculars to see the dots. Toward the end of January, not too far from our neighborhood, when driving on Chapel Valley Road that runs parallel to PD in Fitchburg, I saw trees full of starlings. Other trees were bristling with robins and cedar waxwings. This time, my camera caught the dots on the starlings. Our neighborhood is lucky to be located near the University of Wisconsin Arboretum. One of its many benefits for the public is the Winter Enrichment Nature Lecture Program that takes place on Thursday mornings January through the second week of March. Several neighbors who have attended give it high marks. Since 1968, the Arboretum has offered these lectures for naturalists in the greater Madison area. Originally coordinated by Rosemary Fleming for Arboretum naturalists, the programs are now open to Arboretum volunteers and interested public as space allows. The 2016 series began January 7 and continues through March 10. Lectures are on Thursday mornings from 9 to 11:30 a.m. in the Arboretum Visitor Center auditorium. Individual lectures cost $10 per person (Friends of the Arboretum [FOA]: $9). 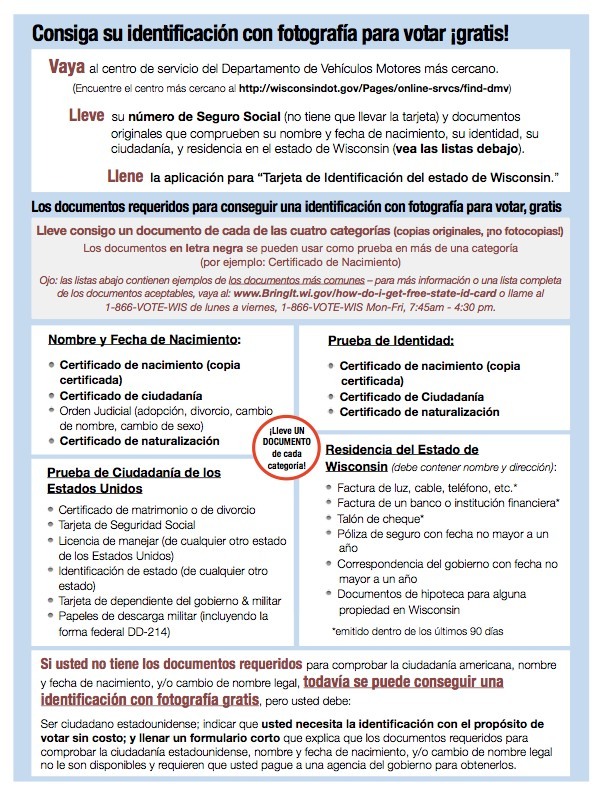 Same-day registration is possible. The remaining lectures are as follows. Bohanan, who is actively involved in citizen science projects on Wisconsin aquatic ecosystems, will discuss pond life in Madison lakes, including Teal Pond. The Arboretum has applied to be listed on the National Register of Historic Places. Fifield Murray will share historical highlights discovered during the investigation process. In this session we will build shared understanding of adolescent needs, promising practices for meeting those needs, and effective response strategies when unexpected behaviors arise. You pick up some interesting facts from the Arboretum’s Winter Enrichment series. Here’s one tidbit. The produce section of the supermarket would be mighty empty without the crops that bees pollinate. 85 % of plants require pollination, and fully 35% of agricutlural pollination is done by managed bees. Pollination is a key ecosystem service benefitting 70% of the world’s crops. Look at the attachment to see how empty the supermarket produce section would be without bees to pollinate the crops. 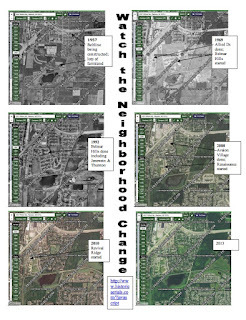 The neighborhood history book, The Best of the Dunn’s Marsh News, displays aerial photos of the neighborhood from 1937, 1958, 1968 and 1986, but a Crawford Drive resident recently found the Facebook page “Lost Madison” which referred her to a website with numerous possibilities for seeing the neighborhood from the air. Just like on Google, with the aerials you can zoom in right to your house or look at the whole neighborhood to watch the changes. 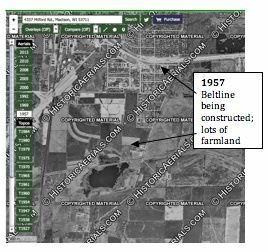 The topo maps let you see how the marsh area has been depicted through the years, while the air photos show you how it has changed through the years. At its opening meetings of the 2015-16 year, the DMNA Council suggested possible priorities for the year. Quite a long list was generated in two categories: (1) our environment and (2) focus on people and resources. A Council vote is underway to determine which of the 8 environmental ideas to pursue and which of the 11 people-related suggestions to concentrate on. Environmental suggestions ranged from a boardwalk along Seminole Highway and an observation deck jutting into Dunn’s Marsh to improving streets with repaving and more lights. Other ideas were getting more art in the neighborhood, mowing paths around the wet pond south of the Cannnonball trail next to Seminole, and regularly picking up litter along the frontage roads. There were even more the ideas focusing on people and our Association. Several involve forging better relations between people in the neighborhood: starting an inter-racial women’s support group, reaching out to Muslim neighbors, involving more cultural diverse neighbors in the DMNA, and working for more cordial relations with the Allied Community Co-op and our sister ADMNA. Other suggestions related to the lack of a grocery store: focusing on a system for helping neighbors get groceries now and for making a grocery store a reality in the neighbohood. A related idea is economic development in the neighborhood to fill empty storefronts - with the help of the city. Two more relate to the computer. They include improving the DMNA website (That is happening right now) and helping residents become computer literate. And finally, there’s the first thing on the list that Council members were asked to rank, getting more DMNA members. When a group of 7 women and one young girl showed up at the Madison City Council building about 5 pm on November 10 to register in favor of funding for a co-op grocery store in the Dunn’s Marsh Neighborhood, at first there was confusion. The only registrations available listed amendments to Madison’s operating and capital budgets. The grocery store item was nowhere to be found on the registration sheets or in the pages of documents available on the Council’s agenda. Well, it turned out, that was good news. When DMNA President Mary Mullen asked Alder Marsha Rummel about how neighbors should register their support, Marsha explained that funding for the grocery store item was not a controversial item. It was in the budget, and the Council would pass it. Only controversial items like funding for a new district police station would be discussed although, of course, we could register and speak if we wanted. As some of the neighborhood activists knew - because they had been at the previous meetings - funding for the co-op store had been recommended by the Board of Estimates on 9/28/15 and had also been approved unanimously by the Council on 10/26/15. Still, an early memo from city staff suggested that appearances at the 11/10/15 Council budget meeting would be wise. So we came. The Allied Community Co-op (ACC) has formed committees and is currently working to bring this cooperative grocery store to birth. ACC Board meetings are the first Thursday of each month, 2 pm, at the Boys and Girls Club, 4619 Jenewein Road. Working meetings are held the second Saturday of each month, 12-1:30 pm, at the same location. These are the people from the neighborhood who came this one last time to demonstrate their support for funding the grocery: from the Crawford part of the neighborhood, Sunshine Jones, Susan Watson, and Jim Lyne; from the Marlborough part of the neighborhood, Mary Mullen, Cindy Harrington, and later on, John Bach; from the Belmar part of the neighborhood, Elvice McAlpine and Linda Miess; and representing the Allied part of the neighborhood, Selena Pettigrew and her granddaughter. A lot of time has passed and we were swamped with making our proposal for a grocery store. Now that longer-term project is underway, and we’re ready to start on the interim-term plan to create a buying club to get food into the neighborhood in the meantime. Please join us this Thursday, February 11, at 4pm at the Boys and Girls Club, 4619 Jenewein Rd. We’ll be joined by Rink DaVee who has run a buying club before and is offering his assistance to get us up and running quickly. We may even be able to put in our first test order this week! Residents of the Marlborough part of the neighborhood watched while the house next door to Prairie UU Society at 2006 Danbury became transformed over the past many months. They may not have realized it, but the house was purchased by the church and is now in full use. It’s called the Annex. The house, originally a parsonage, was purchased by Prairie Society 2013. During the next 2 years it was turned from a home to a space that can legally be used as a public building. Now it’s getting a lot of good use with church staff, committees, and volunteers using it practically every day and a Sunday usage for choir practice and the 6-12th grade class. It’s also available for rental. Sometimes when 2 groups overlap times, one is scheduled for the church building and the other for the Annex. Rental rates for the church building are posted on the Prairie website www.uuprairie.org <http://www.uuprairie.org> Look low in the left-hand column for the link to”Rentals.” Contact the church administrator for Annex rentals at admin@uuprairie.org <mailto:admin@uuprairie.org> or call (608) 271-8218. Prairie Society provides space for Dunn’s Marsh Neighborhood Association meetings and events for free. Prairie and the DMNA have co-sponsored Make Music Madison on the Prairie lawn for 3 years running. Seven people who were part of the mosaic projects in the neighborhood attended this year’s event that was held on January 13. One of artist Elizabeth Doyle’s glass mosaics from the Verona Road roundabout got special recognition as the cover of the booklet given to each attendee. Six other people attended who worked on the tile mosaic murals located between Britta Parkway and the Beltline Frontage Road. They included artist Marcia Yapp, her husband Maury Smith, and neighborhood residents Elvice McAlpine, Patty Stockdale, and Mary Mullen. The Dunn’s Marsh Neighborhood Association was listed as recipient of one of the project grants in the past 2 years. That was for the Marlborough Garden mosaic stepping stone project that put 60 mosaic stepping stones in the garden. Happy New Year! The Verona Road Business Coalition(VRBC) is hosting an Annual Town Hall Meeting on Wednesday, Feb. 10th from 3 – 5:30 pm at EPIC Systems. The guided tour of EPIC starts from 3 – 4:00 pm. The Annual Meeting will follow afterwards starting at 4:30 pm with networking, refreshments and door prizes to follow. Could you please promote this event in your next Dunn’s Marsh Neighborhood newsletter? Great way for the Dunn’s Marsh neighborhood residents to get a ‘guided tour’ of EPIC and to gain the latest updates on the Verona Road construction coming our way in 2016. RSVP now at: http://www.veronaroad.info/business-resources/annual-event/ <http://www.veronaroad.info/business-resources/annual-event/> . Note that even though the invitation says to RSVP by February 5, the VRBC project manager has assured us that there’s plenty of room, and neighbors whether business or otherwise may still register today, February 9. 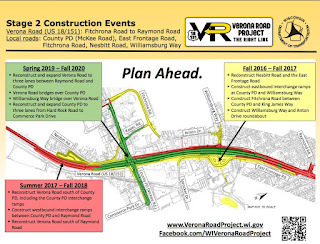 To keep you informed and involved on the Verona Road (US 18/151) Project, we wanted to share an update on the Verona Road Project schedule, specifically Stage 2 construction in the Fitchburg area. Stage 2 extends along Verona Road from Raymond Road south to County PD (McKee Road) and County PD from Fitchrona Road to Commerce Park Drive. Utility relocations by private companies are anticipated to start in March 2016. 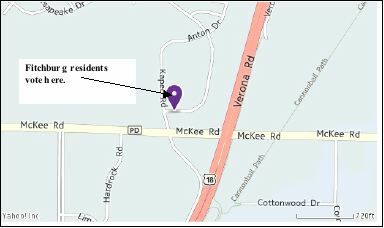 Improvements to some local roads near Verona Road in Fitchburg are scheduled to begin in fall 2016, including the Williamsburg Way/Anton Drive intersection, Fitchrona Road and Nesbitt Road. Download, print and save the Verona Road Project, Stage 2 Construction Schedule <http://lists.wi.gov/t/1150417/2644525/7977/5/ <http://lists.wi.gov/t/1150417/2644525/7977/5/> > . Stage 1 reconstruction work on the westbound Beltline, between Seminole Highway and Whitney Way, and Midvale Boulevard is anticipated to resume in late February/early March 2016 and scheduled to be completed in November 2016. Encourage your family, friends and co-workers to sign up for project email updates <http://lists.wi.gov/t/1150417/2644525/7976/6/ <http://lists.wi.gov/t/1150417/2644525/7976/6/> > ! 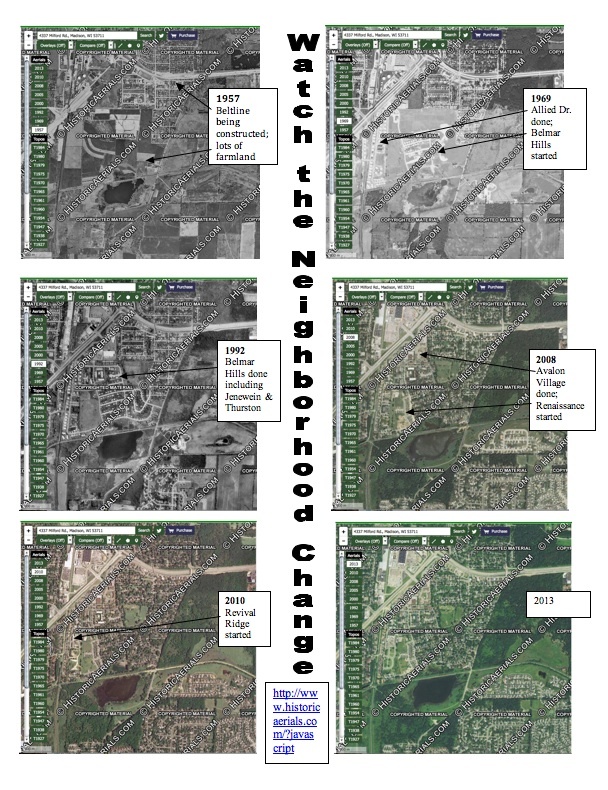 The Dunn’s Marsh Neighborhood Council meets every month on the second Thursday of the month at 6:00 pm at Prairie UU Society, 2010 Whenona Drive. The next meeting is on Thursday, Feb. 11. At this month’s meeting, we will have a special visitor, District 4 Co. Supervisory candidate Richard Kilmer. The public is invited to attend. See article #21 to learn more about Richard Kilmer. He is running unopposed. The Dunn’s Marsh Neighborhood Association’s website is about to get a facelift. Yannette Cole, DMNA Council treasurer, is putting on another hat, that of computer wizard. For a while she’s been working on giving our website a different look. The website address will remain the same - www.dunnsmarsh.org <http://www.dunnsmarsh.org> - and much of the content will be the same or similar, but expect a more stream-lined look. The website is the place to go to learn a lot about the Association, its history, and its activities, including a calendar of events within and/or of interest to neighborhood residents. The DMNA also keeps in contact with residents in 2 other ways. Our Facebook presence is where people can keep up with neighborhood news on a daily or weekly basis. The Dunn’s Marsh Neighborhood Association e-News - which is what you are reading right now - is the third communication resource. Back issues of the e-News are available from a link on the home page of the website. The West District will be starting a weekly "Coffee With A Cop" opportunity this Thursday, February 11. Coffee With a Cop is simply a way for officers and citizens to engage and interact in a relaxed environment. We just received good news about tree-planting in Marlborough Park. You may have noticed that many ash trees were cut last fall, and even more are marked for removal in the future due to devastation caused by the emerald ash borer (EAB). An e-mail from Madison Parks Superintendent Eric Knepp explains that the cut trees will be replaced on a 1 to 1 basis: for every ash tree cut, a new tree will be planted in the park at City of Madison expense. We do have plans to replant trees that are removed on an aggregate 1 to 1 basis (not necessarily a tree going back into the same exact spot) due to the removals from EAB. The individual plans for a park are completed by our Landscape Architects and Landscape Maintenance Workers collaborating. We have a solid amount of funding and expertise, but if there are further questions or interest in getting engaged from the garden community especially we would be happy to discuss options. By the way, the hope would be to replant removed trees within 3 planting seasons, so my hope is we have them in this year. It’s short notice, but you still might want to attend a winter biking workshop that will be held Thursday, Feb. 11 at 6:30 pm at Fitchburg Cycles, 2970 Cahill Main at Fish Hatchery Road. At the workshop, learn how to dress for cold weather riding, check out winter bikes and cold weather gear, learn tips for safe riding in snow and ice, share winter routes and commuting tips. Bring your bike along and learn some maintenance tips and, weather permitting, take a “winter bike” out for a test ride. You can also enjoy free pizza and refreshments. This event is sponsored by the Fitchburg Resource Conservation Commission and Fitchburg Cycles with support from Fitchburg Bicycling Advocates and Pizza Hut. Due to the fact that long-time County Supervisor Kyle Richmond is stepping down, the Madison part of the Dunn’s Marsh Neighborhood will be represented by a new supervisor. Since only one candidate is running for District 4, we know who our representative will be - Richard Kilmer. He’ll take office in April. Mr. Kilmer plans to come to the next DMNA Council meeting on Thursday, February 11, 6 pm, at Prairie UU Society, 2010 Whenona Drive. Residents are invited to come to this meeting to get acquainted with Richard. You know, once you’ve met someone, it’s always much easier if you want to contact that person later to express opinions on a matter that will be voted on. Richard originally moved to Madison in 1971, but his roots run deep in Dane County. His Yeadon and Gunsolus ancestors settled in southern Dane County in the early 1850s, and his Ballweg and Breunig ancestors settled in northern Dane County in the 1870s. Richard grew up in a large close-knit family on a dairy farm near Wonewoc, Wisconsin and has owned his home in the Bay Creek neighborhood since 1986. He also still owns and maintains the family farm in the upper Baraboo bluffs in southern Juneau County. He is currently working on a wetland restoration project at his farm along the Baraboo River and a woodland restoration project. He has a passion for gardening, nature, genealogy and country line dancing. He has been the leader of Dairyland Cowboys and Cowgirls dance group since 2000. Richard has been a tireless advocate for improved access to health care, LGBT rights, and many other progressive political and environmental issues. His partner, Andrew Ringquist, is a nurse and diabetic nurse educator and landscape architect who is currently working on his Masters degree in nursing education. Richard has a 28-year-old son whom he co-parented with lesbian moms. Richard graduated from the University of Wisconsin School of Pharmacy in 1974 and has been a Registered Pharmacist for 40 years, working in such varied places as New York City and Mexico. He returned to Madison after taking a 7,000-mile bicycle trip across Canada and the eastern United States. He started as a pharmacist at WSA Pharmacy (now Community Pharmacy) in 1984. The Pharmacy is a worker's cooperative that has been serving the community since 1972, and recently opened a second location on University Avenue in Middleton. Richard spent many years as president of the Community Pharmacy board and is currently vice president as well as chief pharmacist. Richard has been involved in many organizations over the years. He was an early volunteer for the Madison AIDS Support Network (now ARC) during the early years of the AIDS crisis. He was one of the founders of GALVAnize (now Madison Pride). He was president of the board of The United and helped with its merger with the LGBT Resource Center to become OutReach and was also president of the board of OutReach. He has been on the board of New Harvest Foundation and the City of Madison Business Improvement District Board (BID). He is a member of the Democratic Party of Dane County and Progressive Dane. Richard is also a member of the Wisconsin Mental Health Drug Advisory Committee. Having seen the effects of mental illness (he has a close family member with mental health and addiction problems), Richard wants to see improved services for the mentally ill and homeless people of Dane County. He has been involved with the needle exchange program, suboxone availability programs and worked to provide overdose treatment programs in the county. He would work to improve availability for drug and alcohol treatment, improve clean needle programs and naloxone availability for drug overdoses and improving access to housing for the homeless population. Richard and Community Pharmacy have worked to provide low cost health care and alternative medicines to the community. The Pharmacy has worked with Dane County Parents Network, UW Medic Clinics, Dane County First Offenders program, Access Public Health and many other local organizations to provide prescriptions to uninsured patients for many years. Richard and the Pharmacy have won many awards over the years for their service to the community. Richard received The Community Shares of Wisconsin Sally Sunde Social Justice Award in 1997. Richard is also a clinical professor with the University of Wisconsin School of Pharmacy. Richard's other concerns include improving the environment and helping control unchecked growth in Dane County. The county lakes and environment need to be protected for future generations. He also supports a living wage in Dane County. This has been an issue at Community Pharmacy since it started in 1972; the Pharmacy has worked hard to keep a small gap between the lowest paid workers and the highest paid workers, providing a living wage for all workers. 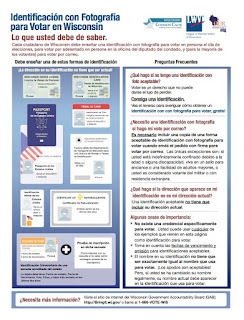 To obtain a state ID card from DOT, bring proof of name, date of birth, identity, citizenship, and WI residency to a DMV (Dept. of Motor Vehicles) office. 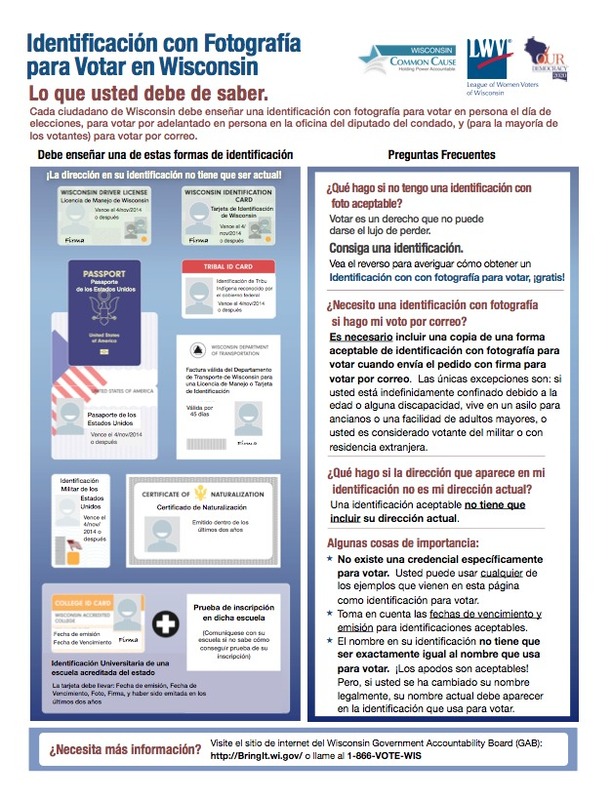 If you don’t have a birth certificate, there is an alternate process to get a state ID. Call the DMV at (608) 266-1069 for more information. 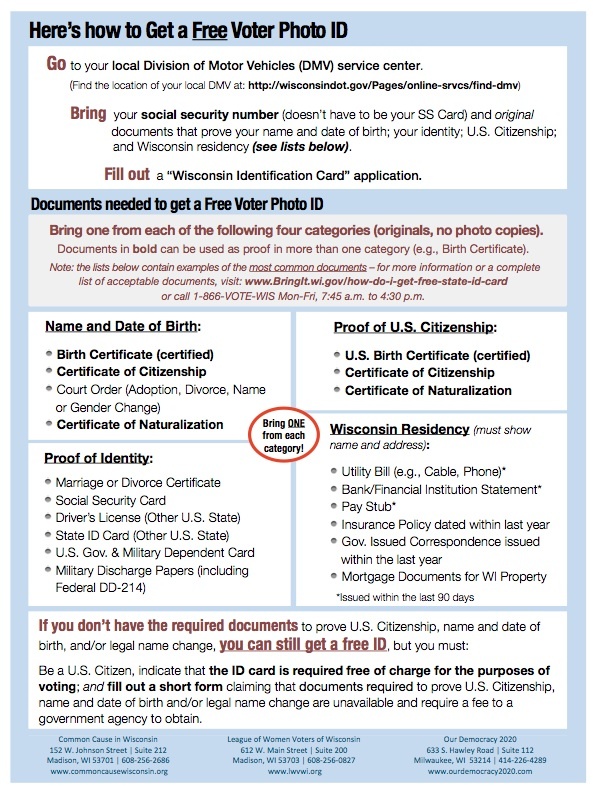 UW - Madison student IDs are not valid photo IDs for voting. 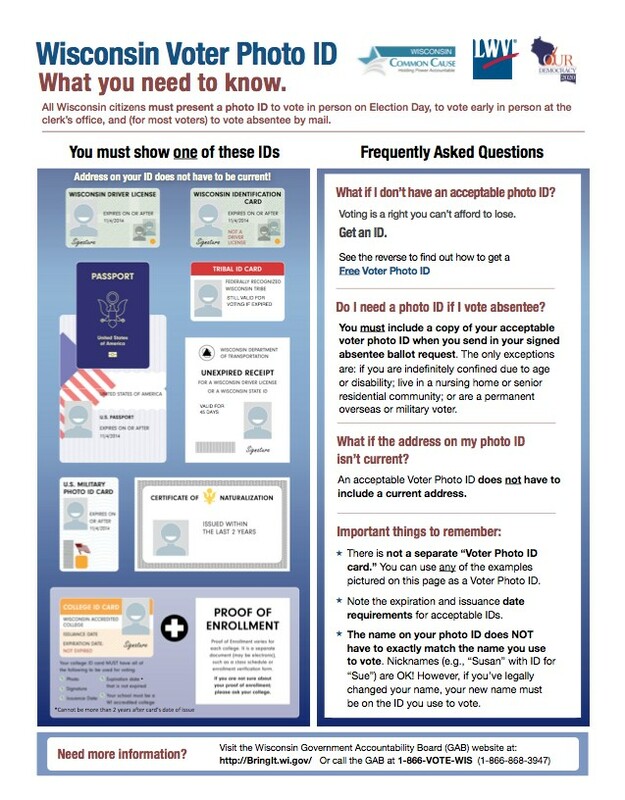 Any student who doesn’t already have a WI driver’s license or ID from DOT can obtain a separate voter ID card by bringing his or her existing Wiscart student ID to the Wiscard office in Union South. 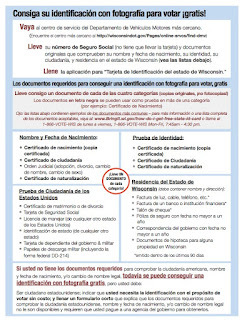 You can find more details online at: www.Bringit.wisconsin.gov <http://www.Bringit.wisconsin.gov> or all (866)VOTE-WIS. 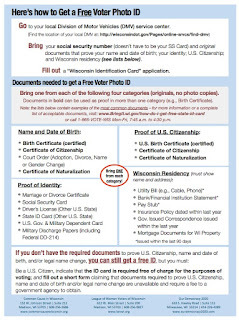 If you haven’t voted in Wisconsin before, or if you’ve moved since the last election, you will need to register to vote. You must have lived at your current address for 28 consectutive days before an election to vote from that address. If you’ve lived there fewer than 28 days, you can still vote from your old address. More information is available from the Madison City Clerk’s web site - http://www.cityofmadison.com/clerk/ at www.myvote.wi.gov <http://www.myvote.wi.gov> and also on the attachments to this newsletter. One set of attachments in in English, while the other is in Spanish. Around the country presidential primary campaigns monopolize the news ad nauseum. By contrast, Wisconsin’s February 16 ballot is pretty tame: it is not a Presidential primary, and it only has one race. Don’t let that fool you. The one race is very, very important: the race for Wisconsin Supreme Court. On February 16, voters will whittle the field of 3 Wisconsin Supreme Court candidates down to two. The 3 candidates for the Supreme Court’s 10-year term are Rebecca G. Bradley, JoAnne F. Kloppenburg, and Joe Donald. After the death of Justice Patrick Crooks, in October 2015 Bradley was appointed by Gov. Walker after spending a few months as his appointee to other lower court positions. JoAnne F. Kloppenburg ran in 2011 for the Supreme Court and was so narrowly defeated that a recount was allowed. Joe Donald is running for Supreme Court for the first time. Read their answers to the League of Women Voters’ questions in Candidates’ Answers at http://www.lwvdanecounty.org/supreme-court-justice The candidates’ e-mails, websites, and social media information is included there too. Additional information is located on the Wisconsin Vote site: http://wisconsinvote.org/candidates-and-races Wisconsin Vote is a service of Wisconsin Public Television and Wisconsin Public Radio and is updated during election season. Content for the website comes from WPT and WPR broadcasts as well as other state and national news and information sources. On a neighborhood note, some neighbors met JoAnne Kloppenburg in July 2014 when she and her husband participated in the Marlborough Community Garden mosaic stepping stone project. Their son Micah Kloppenburg has served as a community garden specialist for Marlborough Garden when CAC was involved in the garden. Micah has continued to provide leadership as a voluteer in the garden. FYI, Wisconsin’s presidential primary doesn’t happen until April. New to the neighborhood? Didn’t vote in the last election (April 2014) even though you’ve lived here awhile? A new voter regardless of your age? 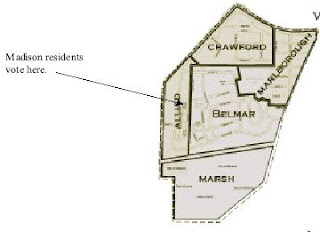 Those who live in the Fitchburg (BELMAR) part of the neighborhood face another hardship. Fitchburg residents vote at Fitchburg Fire Station #2, at 5415 King James Way. This is way down Verona Road to PD. Here’s a map showing that voting location. Are you concerned about racial relations and racial justice? Do you feel your teenagers could benefit from a workshop focusing on this subject? Well, look no further. A free teen workshop called “Let’s Talk About Race” will help teens in grades 8-12 find ways to work towards racial justice and equity in their communities. Emphasis will be on community building and action steps. Facilitated by Groundwork and sponsored by Wisconsin Public Television, this will be an afternoon of fun, learning and lively debate. The workshop will be held on Saturday, February 20, from 12:00 noon until 4:00 p.m. at First Unitarian Society, 900 University Bay Drive, Madison. First Unitarian is located across from the Veteran’s Hospital. To sign up for this free workshop, go to https://www.eventbrite.com/e/lets-talk-about-race-a-conversation-for-teens-tickets-20721284921 <file://localhost/e/lets-talk-about-race-a-conversation-for-teens-tickets-20721284921> A list of frequently asked questions can be found there too. Teens in 8th to 12th grade are welcome regardless of school affiliation. Lunch is provided. from Al Cooper, Dane Dances! Thank you for all of your support of Dane Dances! Dane Dances! is a a month of Friday nights of free dancing to live music on the roof of Monona Terrace. MAMSWaP (The Madison Area Municipal Stormwater Partnership) is hosting a Rain Garden Workshop on Saturday, March 12th at the Lussier Family Heritage Center. Learn how installing a rain garden can add beauty to your property and also protect area waters by capturing stormwater runoff that would otherwise carry pollutants down the storm drain into our lakes, rivers, and streams. The cost of the workshop is only $5 and will cover site design and preparation, plant selection, installation, and maintenance. 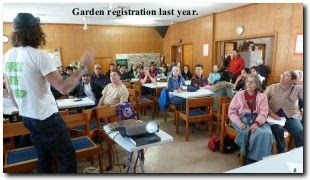 See attached registration form for more information or register online at https://www.eventbrite.com/e/plant-dane-rain-garden-workshop-tickets-21063002006 . Registration and payment must be received by March 4. See Article #29 for how to get plants at a low cost. For more information, contact Christal Campbell, Madison Area Municipal Stormwater Partnership Education Coordinator at (608) 224-3746 or campbell.christal@countyofdane.com . Come prepared to pay for the plot(s) you want to sign up for. A sliding scale offers 3 prices for a 20x20 plot: $10, $35, or $65 depending on your household income and number of people in the family. Some of last year’s gardeners who plan to continue gardening may also have additional fees to pay if they did not attend the 2 required workdays or failed to pay last year’s rental fee. Registration is complete only after the registration form is turned in and all fees are paid. The garden is located at the top of Marlborough Park. It has 160 plots, some tilled by tractor at the beginning of the season and some “no-till” plots that are cultivated entirely beginning to end by the gardener. Water is available on site for setting your bedding plants (tomatoes, cabbage, peppers, etc.) and for watering, by hose, during dry spells. Besides keeping their own plots in good shape, each gardener is asked to attend two workdays during the summer to maintain the area around the outside of the plots. In recent past years, about 100 families have gardened here, a nice multi-cultural mix of English speakers, Spanish speakers, and a number of gardeners who speak Asian languages. All are welcome. The Madison Area Municipal Stormwater Partnership (MAMSWaP) is now accepting orders for its 12th annual Plant Dane! native plant sale! Through a gift from the Graham Martin Foundation (GMF), the Plant Dane! Cost-Share Program provides native plants at the greatly reduced rate of $1.90 each- less than half the normal retail price. The cost-share program is open to schools, non-profit organizations, municipalities and individual residents in Dane County, WI. Native plant gardens are an attractive way to reduce lawn-maintenance time and costs and beautify your property. Choose from more than 70 native plant species including butterfly, shortgrass prairie, and rain garden kits. Plants are $1.90 each and all species must be ordered in multiples of four. Order forms are available online at www.myfairlakes.com/plantDane.aspx . It’s the dead of winter, but planning for summer can’t wait. On the 21st of January, 2 neighborhood leaders and 3 people associated with the “Let’s Eat Out” met in the Avalon Village community room to discuss how the event will work this summer. “Let’s Eat Out” is an initiative to bring diverse neighborhood residents together over food in an outdoor setting. Last year, as will be true this year, one of the locations of “Let’s Eat Out” will be the open space on Revival Ridge Road down the street from the Revival Ridge apartments and the Boys and Girls Club on the western side of the Dunn’s Marsh Neighborhood. Three changes are in the offing. 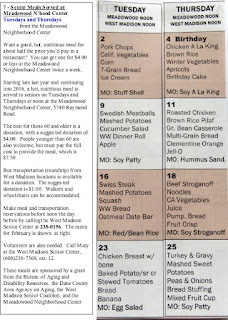 Instead of being 12 weeks long, “Let’s Eat Out” will occur once a week for 8 weeks. 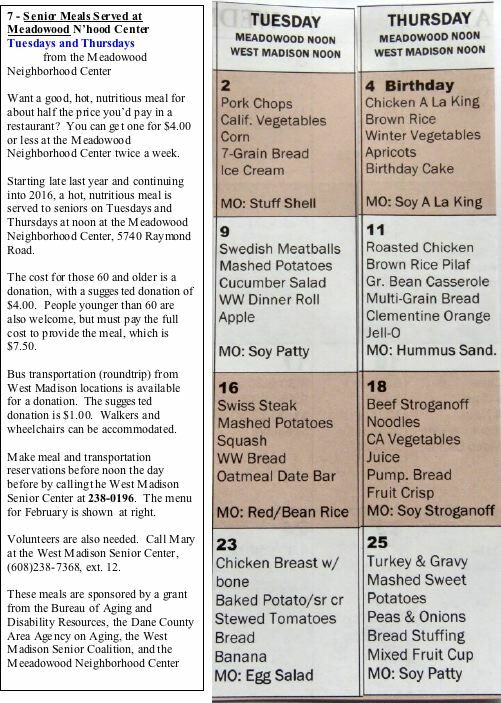 The vouchers for free food will again be offered to low-income residents, but this summer vouchers will be for $3.00 instead of $2.00, and they can only be used for food, not for drinks. Water will be provided free from a big water truck from the Madison Water Utility. All food carts must carry at least one $3.00 food item. The third new wrinkle is that local crafters may set up tables to sell their own handmade craft items such as home-made jewelry, knitting or crocheted items. A major effort this year will be to get more people from the central and eastern part of the neighborhood participating. That’s one purpose of this article - to let everyone who gets this newsletter know that they are especially invited to come and get to know people that aren’t in their everyday life already. The planning group also discussed the other kinds of attractions. Live music, for one. In that regard the Madison Jazz Consortium, karaoke, dance groups including Ballet Folklorica, and rappers were mentioned. Do you know any local group that’s willing to perform for a small stipend? Let us know. Other attractions brainstormed were visits by the library bike (crafts on pedals), a fire engine, the police, MSCR’s Fit2Go van, and “Play and Learn” with jump ropes and other equipment. Now it’s time to put “Let’s Eat Out” on our calendars. The event will be on Wednesdays, 5:00-7:30 pm, starting on June 15 and continuing through August 3. Plan to come at least once. Lately there have been some burglaries in the Marlborough part of the Dunn's Marsh Neighborhood - the area west of Seminole Highway from the Beltline down to Clover Court. One burglar was caught during the last week of January when a neighbor noticed someone walking around to the back yard of a neighbor, then saw a dim light in the neighbor’s house. She called the police who came quickly and caught the thief. Police were hunting around the neighborhood later that night to see if there were any tracks to show that he had been casing or breaking into other homes. Ideas? Keep your shades up and lights on so your neighbors can see into your house. Be sure all your doors are locked when you leave including the door from your garage into your house. Deadbolt locks are a must so that the door can’t be kicked in easily. One burglar obtained access to a house by breaking into the garage through a door that did not have a deadbolt lock. The door into the house wasn't locked, so he had easy access after that. For this burglary, the homeowner and police got excellent photos of the burglar’s footprints in the snow. Report any suspicious activity. These burglars are on foot according to the person who reported suspicious activity that resulted in the arrest. Recently a pizza delivery driver was robbed when she asked for directions in our neighborhood. It goes without saying that if you spot this man, you should call police. As we enter another tax season, two issues stand out as particularly important when prepping for your return: making sure you have all your necessary documents and finding a company you can trust to help you file your taxes. After all, you are entrusting this company or individual with your most valuable personal and financial information. The Wisconsin Department of Agriculture, Trade and Consumer Protection (DATCP) asks the public to be on the lookout for questionable tax practices in the months ahead and to report any suspicious behavior to the agency. "By and large, Wisconsin tax preparation businesses are legitimate and provide an extremely valuable service to consumers," said Frank Frassetto, Division Administrator for Trade and Consumer Protection. "A handful of shady businesses pop up each year, however, collecting personal financial information under false pretenses or secretly filing customer's tax returns and stealing from the refund. "We ask that consumers who see questionable tax practices contact DATCP immediately so that we can take quick action." A common type of tax and loan scam involves tax prep businesses filing returns on behalf of consumers without their consent. These businesses initially solicit the consumers with a promise of providing short-term loans and then pocket exorbitant fees from the tax refunds they file in the consumer's name. Be alert to promotions such as "holiday loans" or other short-term loans that can be used to gain the personal financial information needed to file an individual's tax return. Be careful providing personal financial information to a business unless you want the preparer to file your taxes. Make sure you provide clear direction and that the company specifically advises you on whether they intend to file your tax return. Never sign an authorization permitting a company to file your taxes if you do not want the company to do so. Never sign a document without first reading and understanding what it says. Always insist upon receiving copies of all documents that you are required to sign or that identify the terms of a transaction and the charges you will be required to pay. Confirm, before signing, that you will receive copies. If a business does not agree to provide copies, don't sign. DATCP works with the Wisconsin Departments of Justice and Revenue to detect tax preparation fraud. Anyone suspecting fraudulent activity is encouraged to file a complaint with DATCP. Complaints can be filed online through the DATCP website (http://datcp.wi.gov) or a complaint form can be requested by calling the state's Consumer Protection Hotline at1-800-422-7128. What’s up with fake WhatsApp emails? Malware…that’s what. The latest fraudulent e-mail messages to flood inboxes are using the names of popular online services to trick readers into downloading malware to their devices. Delete these emails immediately without opening them and never click the links in the message. The email addresses associated with the supposed sender have nothing to do with the service in question and are likely hacked accounts. These emails typically claim that you have a missed voicemail or a deferred or missed notification. If you open the email, you will find little more than a link to supposedly hear the voicemail or read the missed message. Clicking the “Play” or “View notifications” (or similar) button or the link in the email will open a website that tries to fool you into downloading malware to your device. For additional information or to file a complaint, visit the Consumer Protection Bureau at http://datcp.wisconsin.gov, send an e-mail to datcphotline@wisconsin.gov or call the Consumer Information Hotline toll-free at 1-800-422-7128. It’s a SCAM! The Federal Trade Commission recently caught on to this scam and is asking for help in tracking down the fraudsters. The Social Security Administration is not offering such a program. It’s actually a “phishing” email designed to get you to click on the link. Doing could cause “malware” to be installed on your computer, like viruses and spyware. The link might also take you to a “spoof” site designed to look like the SSA’s website and ask you to provide personal information, like your Social Security number and bank or credit account numbers. Unsure about whether it’s for real? Here are a couple clues: “hover” your cursor over the address link in the email. Ff it’s fake, you’ll see that the address is an unrelated .com address, not the .gov address it appears to be. And did it end up in your junk folder? If so, that’s because your email filters recognized that it wasn’t for real. If you’re unsure if an email is coming from the government, call them yourself. But use an email address you find yourself, not the contact info listed in the email. Please share this alert with your friends and family and urge them to do the same! Together we can stop scammers in their tracks and keep your hard earned dollars in your pocket where they belong! Answer: Never. Hang up - it's a scam. We've heard about different kinds of imposter scams on the rise. In one scenario, scammers call, pretending to work for Medicare. They say they need to verify your bank account number - and it might sound convincing. Some callers may even know the first few numbers of your account, and say you just need to verify the rest. But if you fill in the blanks, you're giving them access to your money - and their goal is to steal it. The callers may say they lost your information and need it to deposit funds, provide additional benefits, or send you a new Medicare or prescription card. They assure you there's no charge, and act like it's an urgent matter - that your benefits will be cut off if you don't give them your bank account information right away. In truth, it's all a trick to steal your money. Medicare will never call you and ask for your bank account information. •Don't give out your bank account number - or any part of your Social Security number. •Simply hang up the phone. •Report your experience at 1-877-FTC-HELP or ftc.gov/complaint. Click on "Scams and Rip-offs," and then "Imposter Scams." •If you have questions about your Medicare benefits, call 1-800-MEDICARE. Chances are, you know someone who could use a reminder on how to avoid these imposter scams. Pass on this information and share other consumer protection tips with your friends and family. You have received this message from the mailing list of SAIL (Supporting Active Independent Lives). Hi, I want to take this opportunity to thank you for all your help with the organics program. We have come a long way since 1989 when I joined the Streets Division. In that time residents of the City of Madison have recycled or composted 1,686,119 tons of material. That is quite an accomplishment and you should be proud of your efforts. As you may have read, my last day with the Streets Division was January 19th. I will be retiring after 26 years with the City of Madison and I can honestly say that I have enjoyed almost every single day. The success of the City's recycling program has been due to your efforts and those of the men and women of the Streets Division who do the hard work of getting your material picked up every week. Bryan Johnson is the City's new Recycling Coordinator and he will bring his passion to our efforts. I am confident that the program is in good hands and that you will enjoy working with Bryan. I will be keeping track of the organics program going forward, and like many of your friends, wishing the program is expanded into my neighborhood. Again, my sincerest thanks for all of your efforts on behalf of our city and the environment. Recently, I signed my 2016 Budget for Dane County. My budget focuses on providing our critical core services while expanding partnerships to better our community. My budget includes the strongest efforts yet by Dane County to address mental illness. I am expanding our mental health teams to more schools across Dane County in partnership with local schools. Early intervention is key to both preventing and knocking down the barriers that come with mental illness. I am also creating Community Crisis Teams to help law enforcement respond to mental health crisis situations available 24/7. My budget continues our commitment to cleaning up our lakes through partnerships and conservation. Homelessness is a complex problem that no one entity can solve. We are continuing our work with the Homelessness Consortium and investing millions in direct services to our homeless population. I am also doubling our Eviction Prevention Fund which successfully kept 266 kids in their homes last year. This budget furthers our work of criminal justice reform by creating a “Re-entry Team” in our Dane County Jail. We will assess inmates and make an individualized plan for each inmate. A successful re-entry reduces their risk of returning. 70 percent of Wisconsin’s population growth happens in Dane County, as does 56% of Wisconsin’s private sector job growth. We consistently have the lowest rate of unemployment in the state. We are a thriving, growing community, with unlimited potential. While we are certainly not without our growing pains, I am proud of the manner in which our community faces its challenges head on. We will get there, and we will get there together - with respect; with spirited debate, and through partnering, together– the Dane County Way.